Our single point soft hammock is cheaper, lighter and more compact than the more expensive rigid frame �ledges�. Add a little comfort to your first wall, use on back-country and alpine routes with long approaches or as an insurance policy against making the bivy. 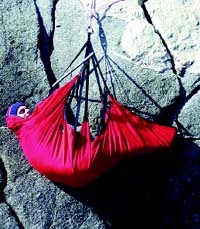 Use also as a plush belay lounge that can be clipped to your harness for carry and set up in a second. Spend the rest of your cash on spring-things.